When did the history of stunt kites begin? Putting it another way, since when have kites had 2 or more lines attached for doing tricks and stunts? I've had a scout around, and here's a few details! As time goes by, I'll make this history of stunt kites more complete and accurate. But for the time being, I reckon it's a fair overview of the development of stunt kiting. Dual line kites have been around for a surprisingly long time. Possibly the first recorded 2-liner was made and flown by a Swiss man, Dr. Colladon, in the mid 1800's. His steerable kites were apparently based on the arch-top single liner which was popular at the time. Have you seen old illustrations featuring a diamond-like design with a curved top edge? That's the arch-top. Following on to this was the so-called Davis Star. This steerable kite was invented in the late 1800's and inspired by the hexagonal single-liners of the day. The Star was designed to get a rescue line to shore, from any ship that found itself in trouble near land. I have not done the required research to discover whether this was ever done! However, it certainly sounds feasible with a large enough kite and light enough line. Modern experiments prove that it flew controllably. Around the turn of the century, the Wright brothers in the United States were famously experimenting with powered flight. But not before doing a lot of work with kites. This included a 2-line box kite. How about that! An unusual 2-line box kite named the Air-o-bian caught the public's attention for a while. The only comfortable way of pronouncing that name would seem to be 'Air-OH-bee-an'. Agree? Does anyone recall their parents or grandparents fiddling around with one of these? Contact me with details if you do! A quick web search has turned up almost nothing. Perhaps Pelham, the kite historian, has written on it somewhere. Thanks are due to Dr Alex Kraaijeveld from the U.K. for making me aware of these pre-1940s occurrences of steerable designs. Here is his illustration of dual-line kite development, which gives a great over-all perspective of the history of stunt kites. Large steerable kites with two control lines were used during the second world war for training naval antiaircraft gunners! A pilot on the ground would fly the kite around, making it hard to hit. I've seen a photo, the kite itself really looked like a Diamond stunter. A fairly big one, standing about as tall as the man holding it. The concept was developed by Paul Garber, a U.S. Navy Commander. However, 2 line steerable kites for the general public didn't appear in stunt kite history until the 60s. In fact, the very first production stunt kite was named the Glite. It went on sale in 1967. This was the era that stunt flying really started to blossom. That's because the Peter Powell Stunt Kite was developed in 1972. At last it was much easier for anyone to buy and fly a stunt kite. 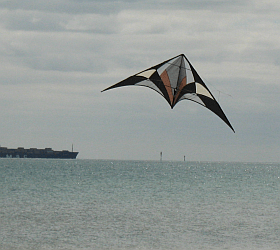 The Peter Powell kite was a diamond with a very long, inflatable tail. The idea at the time was to trace big patterns in the sky with the tail! AN UPDATE: The Sky Stunter Mk III was released by Peter Powell's two sons in early 2014. A modern re-creation of the classic MkII! We have flown it, and it certainly is a great family-friendly stunt kite. During this time, many manufacturers came out with delta shaped stunt kites. Watching or competing in kite flying contests became a cool thing to do. At this point in the history of stunt kites, team flying became a spectator sport with stacked kites performing colorful precision maneuvers in the breeze. People flew deltas, diamonds or flexifoils, depending on their preference. Some well-known names from this period, apart from the still-popular Peter Powells included Hawaiians, Hyperkites, Flexifoils, Trlbys, Rainbows and Skynasaurs. The flexifoils were similar to the parafoils which had been invented in the early 60s, but had a flexible spar running the entire length of the leading edge. The flexifoils got a reputation for being very fast through the air! Any history of stunt kites should mention one particularly notable design of the period, the Mirage. This kite was a cleverly designed tailless delta that managed to win a lot of contests in the mid to late 80s. This design was by Mike Jones, of Jones Airfoils. In those days, flyers would do 3 compulsory maneuvers rated 1-10 plus a 1-3 minute freestyle demonstration. All pretty basic stuff compared to what can be seen in modern contests. Also during the mid 80s, the so-called 'big wing' stunt kites were invented. These kites were deltas with wingspans up to about 2.5 meters (8 feet). The first of this kind was called the Hawaiian Team Kite. From the 90s and on, the early parafoil idea was developed into traction or power kites in which the main idea was to get pulled along on a surfboard, land buggy or snowboard. However, some designs remain in use as sparless stunt kites by a lot of people because there's nothing rigid to break! Great for people just getting started in stunt kite flying. But say 'stunt kite' today, and it really means 'delta stunt kite' to most people. Rip-stop nylon has become the favorite material for kite sails. Not only kites for stunting, but just about every kind of commercially available kite. An example of a sparless stunt kite is the Stardust CAD. Suitable for beginners, it's hardy and doesn't have a huge pull. There are plenty of parafoil stunt kites on the market, with the main advertising catch-phrase being 'nothing to break, just have fun'. A somewhat more high-performing kite design is the Prism Stylus range of kites. These come in ready-to-fly packages which include Spectra lines, winder, flight straps, and a tiny stuff sack or bag for storing and transporting. Seattle Airgear is a company that is very serious about designing, making and flying stunt kites. They use aeronautical engineering know-how to develop their kites. 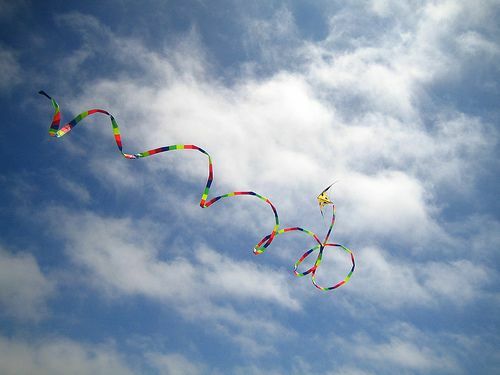 For the more fussy flyer there is the WindDance Dual-line Parafoil Stunt Kite.